This uniform is 1986 dated. 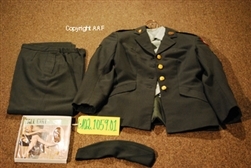 It is a US Army, "Coat, Woman's, Classic Design, Polyester/Wool". This uniform belonged to a Signal Corps. WAC, woman, Specialist 4, serving in the US Forces Far East. This grouping is in EXCELLENT PLUS condition throughout. Sewn to the top of the left sleeve is a round shaped cloth patch which is for the US Forces Far East. There is evidence of a overseas patch once found sewn to the bottom of the left sleeve. 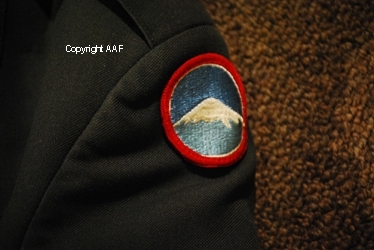 Each sleeve has the cloth rank patches of a Specialist, 4. 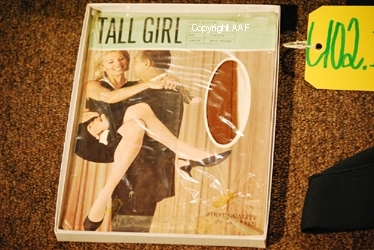 Thie uniform grouping also includes a 1987 dated pair of "Slacks, Women's, Poly/Wool Serge, Green 344, Classic Design", a pair of museum added commerically made pair of pantyhose stockings, a correct style shirt, a 1989 dated, "Cap,Garrison, Army, Women's". This grouping is about as complete as it gets. The museum added the stockings which maybe a bit larger than required. The museum also added the cap and shirt as well. American Red Cross Women's Volunteer Dress & Hat Post 1981 Period, US Army, "Coat, Woman's, Poly/Wool Serge, AG-44", Belonging To A WAC, Woman, Sergeant, Serving In The Signal Corps. May 24th, 1951 dated, US Army, "Jacket, Wool, Taupe, Shade 121 Women's," belonging to a WAC, Woman, Corporal Late 1800's To The Early 1900's Period, U.S., Woman's, Black Color, Funeral/Mourning Dress, With Many Accessories, Belonging To A Woman Names: "Casey"